As we were preparing for the opening of the Boston Handmade store in Downtown Crossing another store south of here was doing their share of renovation and decorating. Craftland is an annual retail craft show in a unique consignment store format in downcity Providence, RI. The show is in their seventh year and features a fantastic assortment of fine craft and handmade kitsch. I stopped by there recently to drop off my inventory, put in my work hours, and pick up some cool postcards designed by Jen Corace. Another Boston Handmader Jen Paulousky of Blue Alvarez Designs will be showing her knitwear and clothing at Craftland. 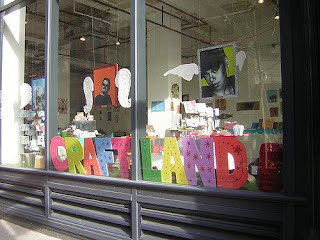 Craftland is located at 235 Westminister St. in downtown Providence, RI. It's open December 5th to the 24th. Open seven days a week from 11 am to 6 pm and 11am to 8pm Thursday's and Saturday's. You can go to www.craftlandshow.com and view the amazing vendor list. Also check out the events they will be hosting there. Some include a book signing with Faythe Levine, co-authur of Handmade Nation and the Buy Art Night sponsored by Whole Foods. 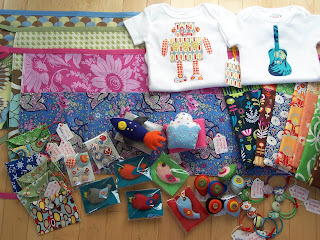 Here's an assortment of some of my goods that I dropped off: craft aprons, appliqued onesies, bibs, baby caps, wrist pin cushions, felt brooches, felt bird hair clips, sunglass cases, button tacks, button hair elastics, and the list goes on and on. So take the pledge and buy handmade this holiday season. You've been busy! What a wonderful array of cheerfulness. You're sure to be a hit. I just keep on sewing and my dad has been coming over and helping me cut some fabric. Yesterday he did my business cards and now today he's doing my tags.